This meal was a triumph of fresh herbs and not-so-fresh bread. 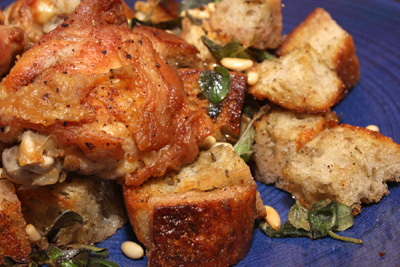 Toasted day-old bread cubes were a crunchy delight in the “Crispy Chicken Thighs & Warm Bread Salad,” from thekitchn. I included a beautiful bunch of fresh oregano in my bread salad, rather than arugula. It dazzled us, mild and green. I would have been happy to use my cast-iron pan here, as the recipe instructs, but I increased my amount of chicken from 6 to 9 whole thighs, so they fit better in my Dutch oven. No problem. Now don’t underestimate the delicious impact of chicken “pan drippings.” When added to the buttered and toasted bread cubes with the red wine vinegar, they completed the “Wow” factor. The chicken was juicy and the bread was the superstar. You’ll realize how smart you are, when a bread salad extends to value and heft of your meal. 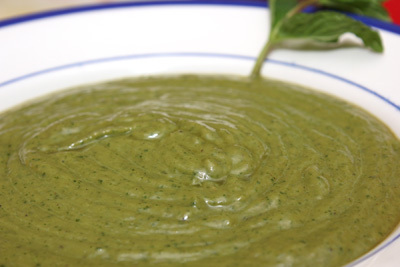 I also celebrated raw greenness with the “Raw Greenylicious Herb Soup,” from Golubka Kitchen. Roughly chop avocado and celery, tear fistfuls of cilantro and mint and throw them all in the blender. Too easy. You also get to use coconut water here, which is a blast. I needed another 1/2 tsp. salt at the end, but otherwise, I thought it was fantastic. Green! Creamy, thanks to the avocado. Quite herbaceous, thanks to the cilantro. Not for the faint-hearted, of course. And unfortunately, Dave and our young child were less-than-enthusiastic with this one. I was excited about it, though. Next time, I will cook (another) “Turkey Meatloaf,” this one from the Berghoff Café cookbook, by Carlyn Berghoff and Nancy Ross Ryan. I will also make the “Festive Carrot Ring,” from Three Many Cooks. Come back to my site soon, to witness this meal.